before i get into this, let me just say that some of Michael's numbers to this point are not where anyone would have expected them to be. in order to get the full story as to why that is, be sure to read my Brantley's June 2015 #s blog in advance of this blog, which contains his overall statistics thus far. **blogger's note: even though it's been somewhat difficult personally for me to watch various stats of Michael's decrease on a nightly basis, my blogs for this season are not going to stop. yes, Michael may be playing too much and not getting any significant time off to rest and potentially gain some strength back in his back, and consequently his numbers may be suffering. but i started documenting Michael's numbers years ago for a reason and i am no quitter. granted, it has not been as fun this year as in the past because he's having a rough go due to injury. and while there may not be a turnaround coming for him any time soon, i will support him regardless, defend him continuously, and make sure the truth is out there. hasn't always been fulfilling those expectations. predictably, i of course stand firm in my belief that he would absolutely be performing at the superior level that was anticipated of him if not for the back strain. damn that back strain. am i crazy to complain about a guy who's batting .300 after 3 months? maybe. but it's becoming a struggle for him to maintain that average. and remember this: if he's mostly having 1-for-4 nights, eventually that BA will become .250 and his stats will be simply mediocre compared to the top dogs in the league. we are shortly coming up on the All Star break, and i hope we haven't seen Michael play his best baseball (from about mid-April to mid-May) of 2015 yet. otherwise, it's going to be a long, sad second half of the year for Michael and his fans. with that said, let's check out Michael's numbers through the first 3 months of the 2015 season. so far in 2015, Michael has a total of 295 plate appearances and 260 at bats in 67 games (519.0 innings). in total, he has 78 hits, 27 extra base hits, 51 singles, 23 doubles, 4 home runs, 38 RBI, 3 sac flies, 29 runs, 32 walks, 5 intentional walks, 9 stolen bases (2nd), 1 caught stealing (3rd), 7 GIDP, 22 strikeouts (15 swinging, 7 looking), 19 first at bat hits, 113 total bases, 117 left on base, 107 putouts, 7 assists, 1 error, and 1 double play. Michael's .300 batting average is currently the 2nd highest on the team out of all the qualifying players. only Jason Kipnis is ahead of him right now, batting .346.
because he had such a fantastic season in 2014, it was hard to expect Michael to have a lot of career highs this year, and that is especially true now that his stats are lower due to the back injury. so there may be less in these blogs going forward, but again, i will not quit. through June, Michael leads the team with 38 RBI, 5 intentional walks, and 9:1 stolen base:caught stealing ratio. he has the least amount of strikeouts among qualifying players as well, with 22.
he leads the outfielders with 7 assists. he's 2nd with 60 games and 519.0 innings in the field, and 3rd with 107 putouts. Michael is 2nd on the team with 78 hits, 23 doubles, 32 walks, 9 stolen bases, 113 total bases, 260 at bats, .300 batting average, .373 OBP, .435 SLG, and .807 OPS. additionally, he's 3rd with 27 extra base hits and 295 plate appearances. after looking over my stats, i learned that Michael set career highs for himself through June with 23 doubles, 32 walks, and 5 intentional walks. he also has a career low 22 strikeouts at this point. since Michael did not add to his home run total in June, he still has just 4 through 3 months of play. he's all but out of the HR race with his teammates lol Brandon Moss leads the team with a whopping 12 home runs, Carlos Santana is 2nd with 9 homers, Jason Kipnis is 3rd with 6, and Roberto Perez and David Murphy are both 4th with 5 homers. meanwhile, Michael is tied for 6th with his 4 homers with Ryan Raburn, who's in a platoon with Murphy and not even playing regularly. Michael continued to battle with Moss for team RBI leader, and currently remains the victor. Moss keeps himself in contention because of his ability to hit bombs, and that's something Michael's clearly not going to do much of this year. Michael had the lead until June 11, then tied Moss for the lead on June 18 with his 35th RBI, then regained the lead on June 22 with his 36th RBI. the Indians as a whole have been having a hard time scoring runs, so if someone on this team had been hot, there's no way Michael would continue to lead the team in this category. the guy batting 3rd on a better team has more than 38 RBI after 3 months, just saying. the HR:RBI ratio needs an update solely because of the RBI Michael added to his total in June. 2 of Michael's 38 RBI so far (5.3%) have come from his solo homers, while 6 of his 38 RBI (15.8%) have come from all 4 of his home runs. Michael's K rate so far in 2015 is 7.5% (22 K/295 PA). he is still the toughest hitter in the American League to strike out and 3rd toughest overall in the majors. he currently averages 1 strikeout for every 13.4 plate appearances. through 3 months, 22 of Michael's total outs have come via the strikeout, proving he continues to make more contact with the ball than not. he also has 92 groundouts versus 78 flyouts and 26 lineouts. Michael had a hit in 53 of the 67 games he's played thus far in 2015 and reached base safely in 58 games. he has 14 hitless games, but still reached base in 5 of those. Michael has 19 multi-hit games, 5 3+ hit games, and 5 multi-RBI games. he has at least 1 RBI in 33 games. in addition, he has 11 go-ahead hits and 13 go-ahead RBI. the Indians are now 31-36 in games that Michael played in and 4-5 in the games he sat out. Michael is presently batting .299 (43-for-144) against right-handed pitchers and .302 (35-for-116) against left-handed pitchers. as i presumed, these BAs have gotten much closer together and right now they're almost identical. a good hitter against both righties and southpaws, this is quite normal for Michael. Michael's hitting .285 (35-for-123) with 17 RBI at home. he has 12 doubles and 3 home runs (15 extra base hits) at Progressive Field, along with 13 runs, 16 walks (2 intentional), 5 stolen bases, 2 GIDP, 11 strikeouts (7 swinging, 4 looking), and 56 total bases while playing 32 out of 38 total home games. he hit safely in 24 of the 32 home games he's played in and safely got on base in 27 of them. he has 8 hitless games at home, reaching base in 3.
on the other hand, Michael's hitting .314 (43-for-137) with 21 RBI away from Progressive Field. he has 11 doubles and 1 home run (12 extra base hits) on the road, along with 16 runs, 16 walks (3 intentional), 4 stolen bases, 1 caught stealing, 5 GIDP, 11 strikeouts (8 swinging, 3 looking), and 57 total bases while playing 35 of 38 total road games. he also hit safely in 29 of 35 road games he's played and got on base safely in 31 of them. he has 6 hitless games away from home, reaching base in 2. Michael had a mostly successful June when batting with RISP and that helped some of his RISP stats, but he's still a long ways away from the league leading clutch hitter, Baltimore's Jimmy Paredes batting .467. Michael ranks 22nd in the AL while Jason Kipnis is 21st. Michael's up to .343 (24-for-70) with runners in scoring position with 31 RBI through June. more specifically, he's hitting .357 (5-for-14) with RISP and 0 outs, .481 (13-for-27) with RISP and 1 out, and .207 (6-for-29) with RISP and 2 outs. he continues to come up short in 2-out RISP situations. with 2 outs in an inning, Michael is now down to batting .266 (25-for-94). he has 5 doubles, 1 home run, 9 RBI, 16 walks, and 10 strikeouts (7 swinging, 3 looking). he's currently an inning-ender. additionally, he's batting .331 (42-for-127) with 36 RBI with runners on base and .125 (1-for-8) with 3 RBI with bases loaded through June. the former decreased a little in one month's time while the latter is still another point of concern in Michael's game right now. lastly, Michael's hitting .271 (36-for-133) with the bases empty, which was an improvement from a month ago. he now has 11 doubles, 2 home runs, and 11 walks when batting with nobody on base. once again, i'm going to compare Michael's 2015 #s so far to other players around major league baseball, but i'm only including his statistics that rank in the top 10. several of his rankings went down due to some of the low stats he tallied in June. among other qualifying players in the American League, he's ranked 3rd in doubles (23) and tied for 10th in intentional walks (5). btw--Michael has now moved up to tied for 11th with his current .300 batting average. at present, Detroit's Miguel Cabrera leads the AL with a .349 BA. among qualifying outfielders in the American League, Michael is 1st in doubles, tied for 2nd in intentional walks, 4th in batting average, 5th in walks (32) and OBP (.373), tied for 6th in hits (78), and tied for 9th in RBI (38) and extra base hits (27). among qualifying left fielders in the American League, Michael ranks 1st in doubles; tied for 1st in intentional walks; 2nd in walks and batting average; 3rd in extra base hits and OBP; tied for 3rd in hits and RBI; tied for 4th in stolen bases (9) and total bases (113); 5th in plate appearances (295), at bats (260), SLG (.435), and OPS (.807); and tied for 7th in runs (29) and games (67). among all major league left fielders, Michael is 1st in doubles; tied for 1st in intentional walks; 3rd in extra base hits and batting average; 4th in walks and OBP; tied for 5th in RBI; 6th in OPS; tied for 6th in hits; tied for 7th in total bases; 8th in plate appearances and SLG; tied for 8th in stolen bases; and 10th in at bats. among all major league outfielders, Michael ranks 1st in doubles, tied for 4th in intentional walks, 8th in batting average, and 10th in OBP. unfortunately, i think Michael played himself out of an All Star reserve role because his month of June was not very stats-heavy. he may have had a better chance if he'd been able to really increase his league rankings, but that didn't happen. nonetheless, here are all the weekly ASG voting updates as they occurred over the last month. the third wave of results of the AL All Star voting came out on June 8, and Michael moved up to 6th place (from 7th the previous week), his highest ranking yet. 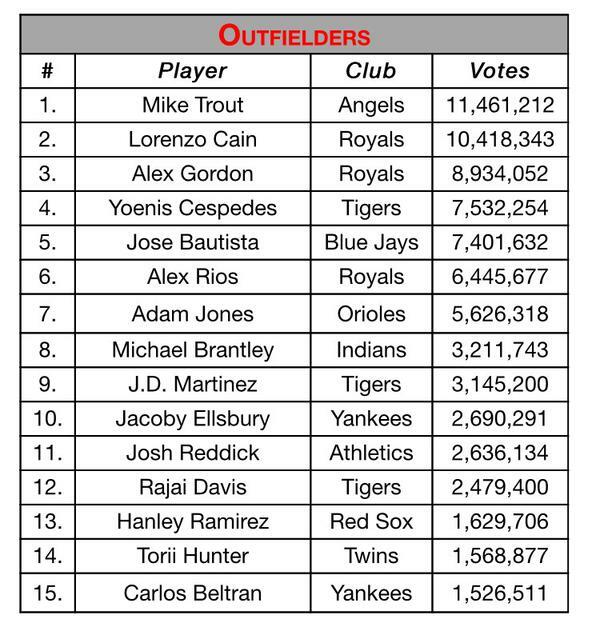 he finally reached over a million votes with a total of 1,466,472. but he was still 1,926,662 votes behind current 3rd starter, Kansas City's Alex Gordon. when the fourth results of the AL All Star voting came out on June 15, Michael had dropped down to 8th place. he had only gained 635,105 votes in a week for a total of 2,101,577 votes, so it's not hard to see why Michael lost ground in the vote. 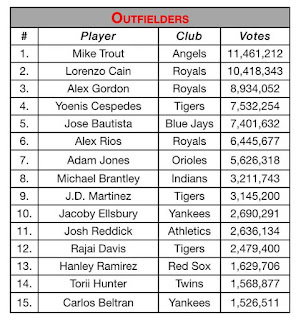 fans of other teams were voting much much more for their outfielders, as evidenced by the fact that Detroit's Yoenis Cespedes (ranked 6th) and Toronto's Jose Bautista (7th) both passed him. this slow week put Michael 3,479,519 votes behind still 3rd current starter, Alex Gordon. the sixth results of the AL All Star voting came out on June 29, and Michael still had not moved from 8th place. he had 3,211,743 votes, an increase of just 370,923. now he's a colossal 5,722,309 votes behind 3rd current starter, Alex Gordon. and may i point out, that Michael actually has more hits, more doubles, more RBI, a higher batting average, and less strikeouts than Gordon. either Indians fans aren't big on voting, or else Michael's "fans" have given up on him since he's been dealing with the back strain. i guess these results shouldn't be too surprising. i mean, with the way the Indians have mainly been promoting Jason Kipnis for the All Star game, fans have seemingly been leaving Michael off their ballots. Michael's back has somewhat limited his range in the outfield this year, but for the most part, he's done a good job defensively. he has a combined 107 putouts in both left and center field in 2015 so far. he also has 7 outfield assists, 1 error, 1 double play, and a .991 fielding percentage. as the left fielder, Michael has 84 putouts, 6 assists, 1 error, 1 double play, and a .989 fielding percentage after 3 months this year. as the center fielder, he has 23 putouts, 1 assist, and a perfect 1.000 fielding percentage thus far. special attention must be paid to the one blemish on Michael's defensive record, aka the error he recently committed, because it sadly put an end to his errorless streak. Michael played 202 consecutive games in the outfield without an error, from April 4, 2014 to the 1st game of the doubleheader on June 28, 2015, before engaging in a fielding error on June 29. prior to that, his last error occurred in the 2nd game of a doubleheader on April 2, 2014. it again was a fielding error, except it came when he played in center field. Michael's previous error in left field was on August 20, 2011. so between then and his error this season, Michael played 310 consecutive games in left field without committing an error. that's pretty damn impressive. this most recent error, however, was particularly gut-wrenching for me because he was just 45 games shy of tying the 247-game franchise record he set last season. Michael's barely averaged 1 error per season over his last 3 years in the bigs, so i was very confident he could re-set that record. it's a shame he didn't. moving on to some happier news, Michael's 6 assists in left field rank 2nd among all AL left fielders. he's only 1 assist behind Detroit's Yoenis Cespedes, but Cespedes does have 5 total errors to Michael's 1. Michael's 1 double play is ranked 3rd along with 6 other AL left fielders right now as well. he is also currently 3rd with his .989 fielding percentage. among all MLB left fielders, Michael's 6 assists rank tied for 3rd with LA Dodgers' Scott Van Slyke. besides Cespedes, Chris Coghlan of the Chicago Cubs is tied for 1st with 7 assists. among all AL outfielders, Michael's 7 total assists rank tied for 5th (with 3 other players). among all MLB outfielders, Michael's 7 assists rank tied for 5th (with 6 other players). now let's break down the numbers. i am going to document his 2015 #s through June, the 3rd spot #s, and the DH #s, as well as the left field #s, the center field #s, and overall outfield #s.
Michael played in 67 (of 76) games, 60 complete, in 2015 through June. he started and played left in 45 games, completing 37 of those games, appearing in 51 total. he was subbed out of 6 games after 43 innings; 2 games after 14 innings (7 innings/7 innings per game) because the Indians were losing by a lot, and 4 games after 29 innings (7 innings/8 innings/8 innings/6 innings per game) because the Indians were winning a blowout and he had done more than enough in the game. he started and played center in 15 games, completing 8 of those games, appearing in 17 total. he was subbed out of 1 game after 6 innings because the Indians were getting blown out. he was part of a defensive switch in 8 games, moving from center to left in 6 games and moving from left to center in 2 games. 6 innings with 3 official at bats in 1 game. he started and was the DH for 7 games. Michael bat 3rd in 67 games. Brantley's June 2015 #s blog. see you next month with another recap of Michael's overall numbers so far!